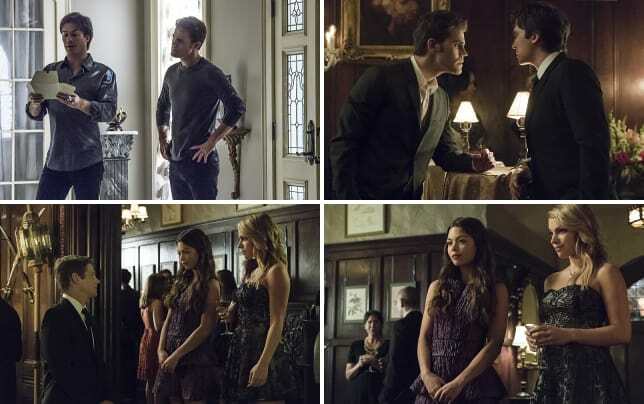 We have a new 'ship thanks to the opening scenes from The Vampire Diaries Season 7 Episode 5! Welcome, BONENZO! At some point in the future, Bonnie and Enzo become a couple, and "Live Through This" set the stage for how they get together. It starts with a heartbroken vampire and a witch who needs a little love in her life. Plus a few other things we're sure will happen along the way. 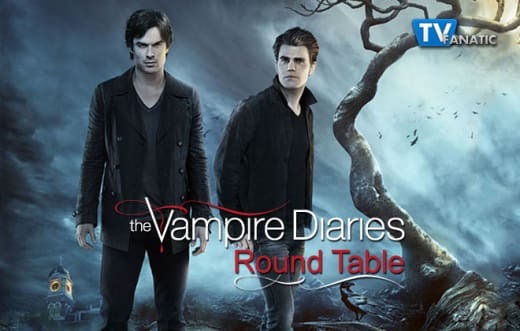 Paul Dailly, Amanda Steinmetz, Carissa Pavlica, Miranda Wicker, and Ruthie Heard from The Vampire Diaries Online break down the latest episode below! What was your favorite quote or scene from "Live Through This?" Paul: My favorite scene was the final one with Bamon. I'm loving these two as friends. Amanda: I agree with Paul. The Bamon friendship is always fantastic. I'm also glad she supported Damon's plan to kill Julian and destroy his mother's life. Carissa: Mine was future Bonnie in the sanatorium. Why was she there? What drove her there and who was she talking about? I'm assuming it wasn't Enzo, since he just popped up. Ruthie: I'm going to go with favorite quote this time. Damon's "Everything is coming up Salvatore!" Miranda: Ruthie, I loved that line so much I included it on The Vampire Diaries quotes page! 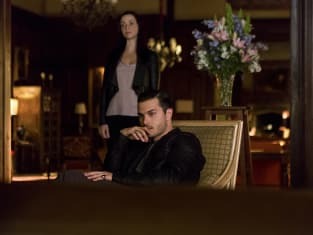 I loved the scenes between Bonnie and Enzo because it really paved the way for how they end up together in the future. Paul: This was quite the twist. It sure looked like he was there to end her when she walked in the room, right? It should be interesting to see how they get together. Amanda: I'm all for it! There's such a disconnect between their relationship in the present and in the future. I can't wait to see how their romance develops. Carissa: Since it's such a surprise, I liked it. It's good when unexpected couples happen. This one didn't feel like it was just there for the shock factor, either. I bought it. Now I'll be watching for the seeds to be planted. Ruthie: I'm also excited to see how they end up together and very intrigued to see who Bonnie was talking about when she said she lost someone she loved but a little scared as well. Miranda: I'm just really glad to see Kat Graham getting an interesting story this season, first of all. Putting her with Enzo is icing on the cake! How long could she hold out on dating a vampire anyway? They're all pretty irresistible. Yeah, I'm a fan of this pairing. What happens to Jo and Alaric now that they both know that she isn't really Jo? Paul: I have no idea. Wouldn't it have been more fitting if she was really Jo and they all lived happily ever after? Yeah, not on this show. Amanda: No clue, but it would be interesting if Alaric ended up falling for whoever is trapped in his wife's body. That would be crazy! Carissa: That was weird. Why did she know so much about Jo from the get go? That confused me. I agree with Amanda that it would be interesting if Alaric fell for whoever was in Jo's body. They seemed decent enough. But there will likely be something catastrophic that comes with the resurrection we haven't seen yet. Ruthie: I'm just glad to see Jodi Lyn O'Keefe back on the show. And even more interested in finding out just who is in her body. I think it might be someone we already know. My guess is Katherine, but wouldn't it be cool if it was Jenna? But that would mean she didn't find peace after all as Esther had told Elena. Miranda: Oh, Ruthie! I love the idea that it could be Aunt Jenna, but wouldn't she recognize him? Oh, man. Now I really want that to be what happens. I think Alaric will fall in love with whomever is in Jo's body because he's so in love with Jo and the idea of having her back. What I want to know is whether or not Jo's a vampire now or if the fact that a vampire soul is trapped in a human body has turned this vampire back into a sort-of human. How do you feel about the comparisons between Lily and Julian's relationship and Damon and Elena? Paul: I never really picked up on it, but if it's some stupid way of reminding us of Delena, then it's a gigantic failure. Amanda: Yeah, the thought never crossed my mind. Carissa: I guess I haven't seen enough between Lily and Julian to compare them to anybody at this point, let alone an epic love like Damon and Elena. I barely know Lily, let alone Julian. Ruthie: Haha...next question. We will let you weigh in on this Miranda. I don't see it either. The Vampire Diaries Photos from "Live Through This"
What happens to Steroline now that Stefan knows he could've been a dad? Paul: There's going to be some sort of grief period for Stefan and it isn't going to include Caroline. This could be the beginning of the end for them. Amanda: He'll be angsty, that much I know. I want Stefan and Caroline to be together, but I'm sure the lingering feelings between Stefan and Valerie will get in the way. I'm still holding out hope that the baby won't pop up down the road. There's been far too many vampire babies in TV and film for my liking. Carissa: I'm not even sure guessing what happens to them is valid anymore. We know they part. It's just a matter of why and when. It's inevitable, and with enough time for Caro to fall in love and get engaged, and have a full time career in a newsroom, so they have to be separated for at least a year, right? Probably longer. You don't just get out of college and take over a newsroom with your fiance in tow. I'm guessing they break up right quick. Ruthie: It's really hard to know. I hate knowing they aren't together in the 3 year time jump. I'm still hoping all of these scenarios we are seeing in the time jump won't be the real deal. Either by someone changing the future or it all being a huge dream, even though I'm having a blast seeing them. I look forward to the time jumps every week! Miranda: I have a love-hate relationship with the way drama is created between the couples on the series. I get why it has to happen, but for the love. Can't anyone ever just be happy? I sort of think Stefan and Caroline's split isn't because of a rift between them but to keep her safe from whomever has marked Stefan in the future. Speaking specifically about the baby-who-could've-been, I think she'll be there for him and comfort him and he'll push her away. 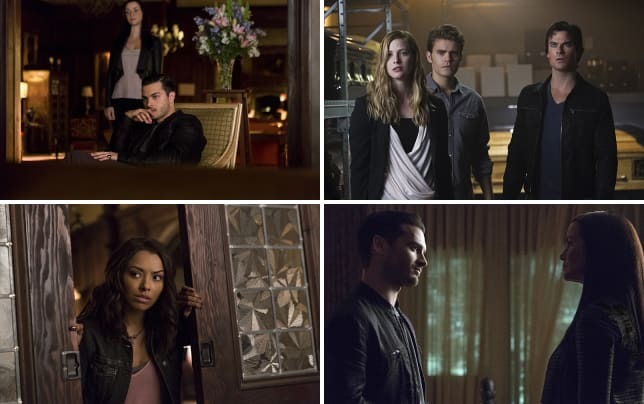 The Vampire Diaries Photos from "Best Served Cold"
The Vampire Diaries Season 7 Episode 6 airs Thursday night at 8/7c on The CW but you can watch The Vampire Diaries online right here!